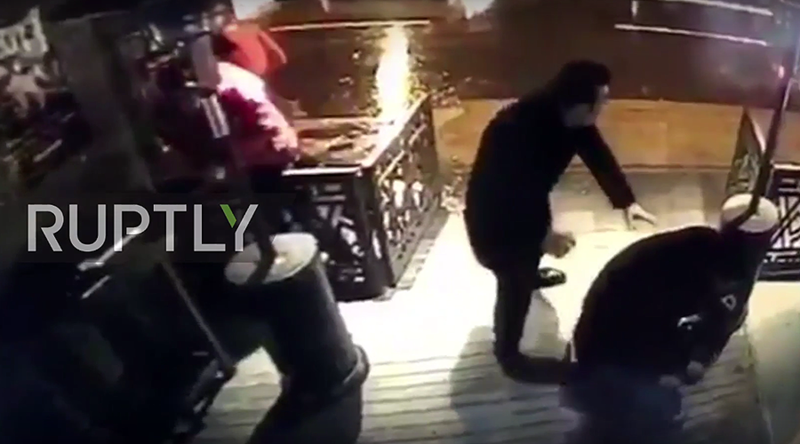 A horrendous video has emerged online, showing an attacker armed with a rifle shooting directly at people at Istanbul’s Reina nightclub. In CCTV footage, several people can be seen running and ducking for cover by an apparent entrance to a building in the street. A small dog can also be seen running away from the scene, as gunshots are visible right in the middle of the shot. An attacker wearing a hat with a pompom then appears in the shot, his weapon in hand, aiming directly at his victims. He shoots right at them, and at least two people are seen falling to the ground. On Sunday, just over an hour into 2017, an unidentified gunman opened fire at partygoers at the Reina nightclub in Istanbul's popular Ortakoy neighborhood. The attack, which Turkish authorities are treating as a terrorist act, claimed at least 39 lives and injured almost 70. The gunman is reported to be still at large.